Fairfield Prep's Axel Whamond is held by East Hartford's Garvans Pamphile during their second round game in the Class LL boys soccer playoffs at Fairfield University in Fairfield, Conn. on Thursday, October 8, 2018. FAIRFIELD — On Thursday afternoon Fairfield Prep wanted to extend one of the best boys soccer seasons in its school history. East Hartford had different ideas. Two goals from Robert Sam helped the No. 19 Hornets pull off a 3-0 upset of the No. 3 Jesuits in the second round of the Class LL tournament at Rafferty Stadium. East Hartford moves on to play at No. 6 Danbury Saturday in the quarterfinals. Two days earlier East Hartford made the trek to Fairfield and defeated Ludlowe in the first round 2-0 — both goals scored by Sam. Fairfield Prep, the SCC champion, finishes its season at 18-2-1. Afterward Jesuits coach Ryan Lyddy took a big picture approach. He highlighted out-of-state wins against Massachusetts’ Boston College High and St. Anthony’s of New York, along with numerous players moving on to play in college. In the first half neither side created many chances. Sam gave the Hornets a 1-0 lead in the 51st minute. He used his 6-foot-3 frame to power through a pair of Jesuits defenders and deftly finished from close range with his right foot. 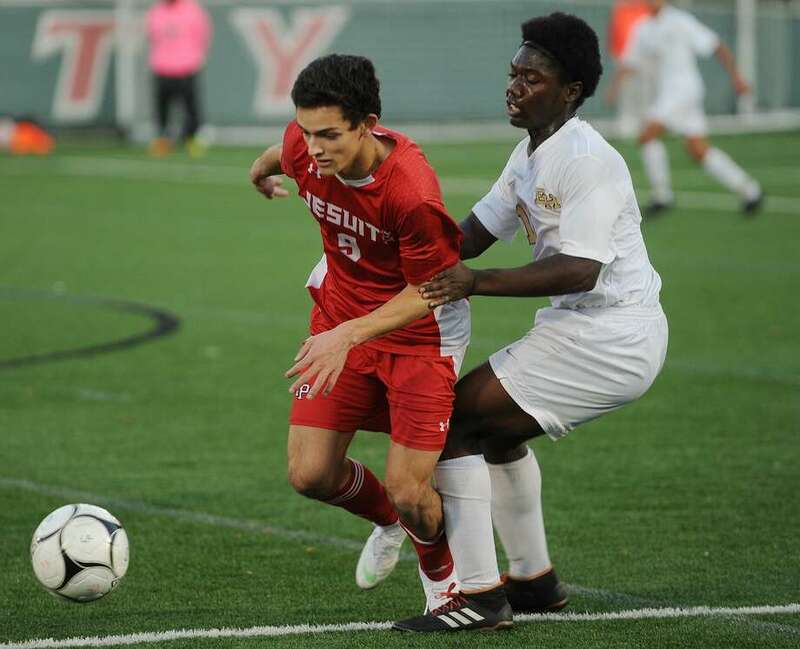 “(Sam) was probably the toughest opponent we faced all year marking-wise,” Jesuits senior Ross Keblish said. Down a goal Prep pressed forward, but it left space for East Hartford to capitalize on the counter attack. Sam doubled the Hornets’ advantage six minutes later using his speed to find space in the Jesuits defense. East Hartford (11-4-3) finished it off with 11 minutes to play — again on the counter attack. This time Wilbert Hercules streaked up the left side and centered to Emmanuel Ofori to make it 3-0. The Jesuits best chance in the second half came through senior Axel Whamond, who got behind the Hornets defense with about 20 minutes remaining, but his shot went wide. Robert Sam, East Hartford — The 6-foot-3 senior scored twice and dominated the game with his pace and physicality at the top of the Hornets attack. Sam has 15 goals on the season and said he hopes to play in college. “We should have just gotten a hotel on this side of the state.” — East Hartford coach Michael Vendetti, whose team defeated Fairfield Ludlowe and Fairfield Prep in the first two rounds and now plays at Danbury in the quarterfinals on Saturday.